Well, it handles. That’s for sure. 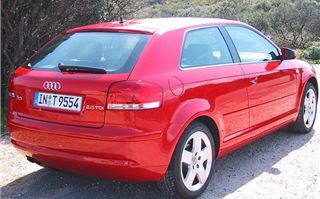 The old Audi A3 was pretty good for its day. The Golf Mk IV and the Octavia took handling a step back. 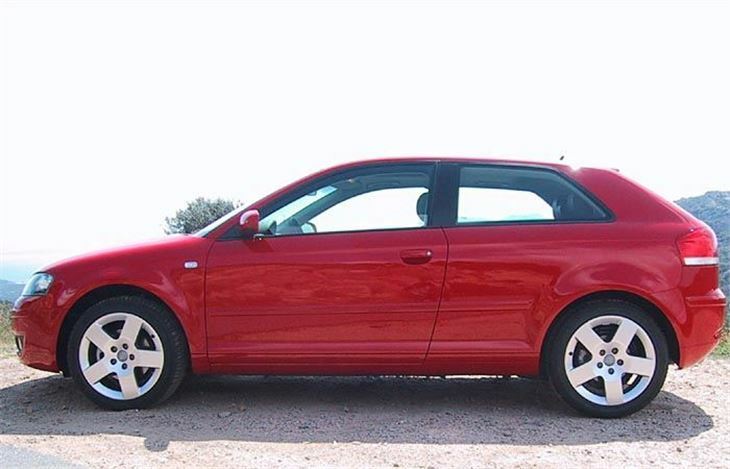 The SEAT Leon brought it forward again. But the 2003 A3 shifts the goalposts altogether. Outside, it’s chunky good looking and Audi-like. 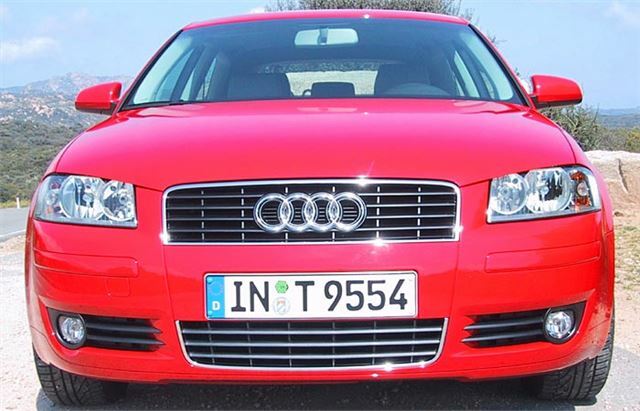 First with the new corporate two-tier Audi grille, like the Nuvolari concept car. Inside, you get a fully adjustable driving position and an interior that quietly shouts quality. Getting comfortable takes no time at all and, unlike some former Audis, you don’t feel the need to re-adjust yourself afterwards. Turn the key, move off and the controls are light but with plenty of feel. Especially the new electro-mechanical steering that gives plenty of positive yet unintrusive feedback. Gearchange quality of the six speeders (2.TDI and 2.0FSI) varies from car to car, but the five-speeders on the 1.6i and 1.9TDI were fine. And the groovy walking stick-like handbrake gives you something to point out to a passenger new to the car. First off, we drove the new 2.0 TDI 16v that pumps out an unstressy 140bhp and 320Nm torque. It scoots along very well, with plenty of punch, and doesn’t mind being revved and held above 4,000rpm. Pick the right gear, brake in the right place, choose the right line and it settles into serious bends superbly. Bit of tyre squeak if you push it, of course. But no drama. It’s a far finer handling car than an A4. It’s also extremely refined with excellent ride quality, so to get the grip you don’t have to suffer constant jiggling. It proves handling need not mean discomfort. Apart from the suspension the reason for this is a 30% stiffer bodyshell than the old A4 with very fine, very precise shut-lines. The less a body twists, the better the suspension can work and the less likelihood of rattles. What it isn’t good at is parking. The back seat is even more claustrophobic than the original A3’s. Legroom is tight. Centre rear passenger legroom in non-existent due to the high centre tunnel (it’s for small children only). And the view out back for reversing is almost as bad as a Calibra. You can get it right using mirrors and the park distance control. But it isn’t an instinctively easy reverser. And I guess most owners will simply ditch the centre rear head restraint. The new 2.0 16v Fuel Stratified Injection petrol engine offers a smoother alternative to a diesel. It puts out 150PS yet still delivers an impressive 40.9 mpg on the combined cycle, about 11 mpg behind the 2.0 TDI, but a fraction better than the 1.6. This comes at a price, though, because to get the good figure you have to use 98Ron petrol which, in the UK at least, means Shell Optimax. But if smooth four cylinder power and decent economy is what you want, it delivers. The 1.9TDI PD 105 is the old 100bhp engine brought a bit more up to date with revised pumpe duse technology. It works very well. Much better than the disappointing TDI PD 100 and with bags of low speed torque. 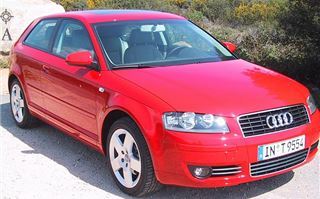 It will cost a lot less than the 2.0 TDI PD 140 but is far from a poverty choice. The surprise of the cars we drove was the last one: the entry level 1.6 petrol. It really is a nice, sweet car with enough power for most people, decent ride, roadholding and handling and good 5-speed manual shift quality. Not quite as much grip as the bigger tyred, more powerful A3s and, like the 1.9TDI, a very slight over-centre feel to the steering sometimes, but nothing to complain about. Base model it may be, yet it’s still a fine car. We didn’t get to drive the all-singing, all-dancing 3.2V6 Quattro, which effectively replaces the old S3. A stop-press announcement told us power has been upped to a full 250bhp, ten more then the Golf R32. It will have the Haldex clutched Quattro four wheel drive system of the TT. And also gets the new Dynamic Shift (DSG) Six Speed gearbox that does away with a clutch pedal by means of a clever new liquid twin clutch which is the first big advance in conventional automatic gearbox technology since the torque converter. Unlike everyone else’s dry autoclutches, it cannot burn out. You can even hold the car on the brakes with your right foot flat to the floor and as soon as you slip your left foot off the brake the gearbox optimises its response a bit like Formula 1 ‘launch control’. Can’t wait to try that one. The engine was very eager, refined and smooth, and very flexible - even for a turbo diesel. The gearbox was precise with a short throw action. It was difficult to feel the clutch take up point. The steering was light at parking speeds and weighted up on the move - still a bit light for my taste but that is just my preference. The steering was accurate and to my view had good feel to it - better than the few BMWs and Mercs I have driven. The ride was well damped and smooth, comfortable, with good body control. The handling was very good, confidence inspiring and with good grip on the 16" wheels. Brakes were excellent. Cabin was excellent. Rear visibility through the rear window poor, better through wing mirrors for reversing - parking sensor recommended. The engine was very eager, refined and smooth, encouraging (despite very low mileage) the use of the higher revs. The engine was also quite willing at lower revs upper. A very nice petrol engine. The gearbox was precise with a short throw action. It was difficult to feel the clutch take up point. With the larger wheels and wider tyres, the steering was improved over the SE, still light at parking speeds and weighted up nicely on the move, at all times accurate, and with good feedback - excellent. The ride was firmer than the SE as you would expect but was still well damped with excellent body control, and definitely a comfortable ride. Over a few hundred yards of poor road surface, the ride was still good despite the lower, stiffer suspension and larger wheels. The handling was excellent - better than the SE, confidence inspiring and with excellent grip - capable of going quicker round the corners than I was willing to go. Brakes were excellent. Cabin and rear visibility as before. New A3 overall - need I say more other than I'm smitten and have ordered one (2.0TDI Sport).